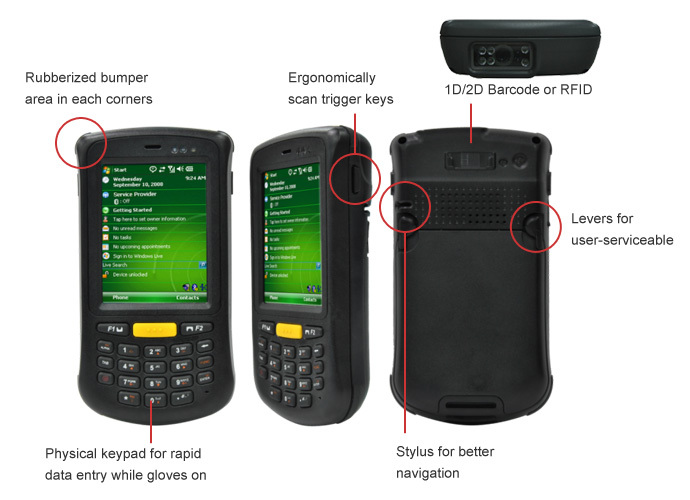 Winmate has always believed in offering customers choices and making this cost effective compact PDA platform available with essentially three different operating systems (Android 2.3.4, Windows CE 6.0, and Windows Mobile 6.5) certainly provides plenty of choice for application developers. On the processor side, C350T is quite modern for industrial handheld, using Texas Instruments DM3730 processor running at 1GHz. This is an OMAP-compatible package with an ARM Cortex-A8 core and a powerful graphics accelerator. And the C350T also includes new-era tech such as a micro-SD card slot, speedy 802.11b/g/n WiFi, integrated GPS, an optional 5 MP camera, and optional 3G mobile broadband. And that's on top of also available scanners and RFID. As far as environmental specs go, the device is sealed to IP54 specifications, as meaning the C350T can handle a bit of dust and rain. The unit can be used in most operating environment, albeit not commercial freezers. The device carries a 4-foot drop spec, which means it will easily survive being dropped on the ground while being carried around. Winmate also performed a "tumble" test which sort of mimics it being dropped out of a pocket while walking, or falling off a moving cart. Overall, the C350T feels sturdy and trust-inspiring. It's not likely that it will physically break on the job.